This is the best look yet at the 2015 Ford Mustang. These are real, detailed photos of the S550; the 6th generation of Ford’s ponycar. Love it or hate it, it’s here and won’t be going anywhere until the next redesign–likely 10 years from now. UPDATE: AmericanMuscle has exclusive coverage of the 2015 Mustang as well as details and specs. For many, the new Mustang will take time to grow on them. Even I was skeptical at first when the 2005 redesign was released, but those cars have now grown into one of the most recognizable and beloved Mustangs, and one of my personal favorites. Tune back in later as we’ll be bringing you photos live from Times Square ( UPDATE: exclusive Good Morning America release footage) where Ford will be showing off the new Mustang starting at 7:00AM EST tomorrow morning. Ford has also confirmed for us that the car will indeed be featured on Good Morning America tomorrow as well. Now that you’ve seen the car, what’s your take on it? Love it, or hate it? Did Ford hit a home run, or commit a huge blunder? 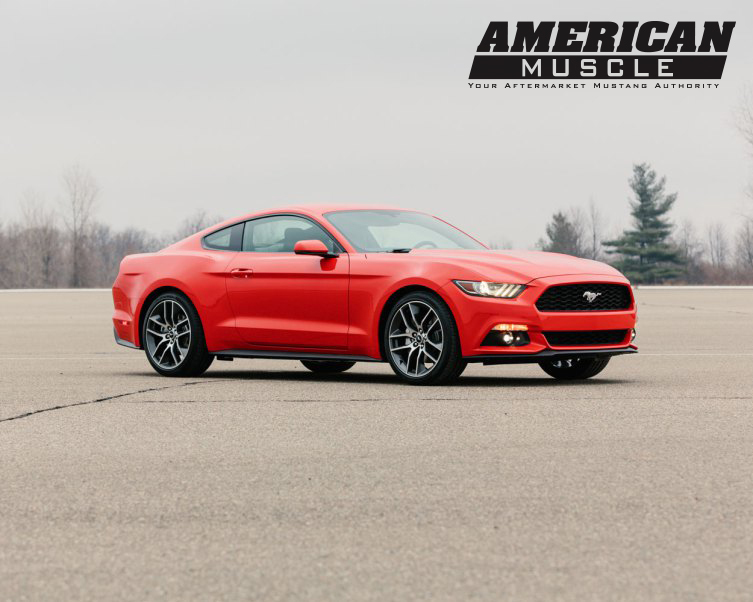 Previous Entry Live From New York: AmericanMuscle Will be Bringing You The 2015 Mustang on Thursday, December 5th! Much like the ’05 redesign, I’m on the fence. I think it’ll grow on us, though. I need to see those tail lights in person. The 2013 lights probably will be my favorite of all time. No pics from the back? I agree Robert. I want to get the Raxiom 13/14 taillights for my 06. I agree, and I am not trading in my 2013! I think I still prefer the 2005 design. I loved that the Camaro, Challenger, and Mustang came back with retro-inspired looks. This version seems to be starting to stray away from that. If you squint, it almost looks like a GT-R.
Take a jacked up rendition of the rear end of a Camaro, a squashed mid section of an Accord (http://preview.netcarshow.com/Honda-Accord_Coupe-2013-hd.jpg), and the face of an angry blow fish and you’ve found the 2015 Mustang. I think it looks like crap compared to the outgoing S197.. I’d say that it looks like a Fusion or Taurus but that would be an injustice to those cars. These pics are still renderings…..tomorrow Ford will show the real Mustang! Take a jacked up rendition of the rear end of a Camaro, a squashed mid section of an Accord, and the face of an angry blow fish and you’ve found the 2015 Mustang. I think it looks like crap compared to the outgoing S197.. I’d say that it looks like a Fusion or Taurus but that would be an injustice to those cars. Will need to see the rear end to make a decision. If you all want to keep your 05-14 mustangs cause they’re the best (In fairness they are great, 2012 being my favorite), then that’s fine. This car will blow the doors off the s197 on the road. The retro look was a smart/dumb decision, it rekindled interest in the mustang, but it has also spoiled everyone rotten that a new mustang has to look like an updated 60’s model. Fox bodies hardly resemble a 65 yet its one of the most successful platforms. Just give the s550 some time. How do you figure it will blow the doors off the S197, on a road course I would be inclined to agree but at the strip or city/highway spirited driving from light to light I wouldn’t go as far as to say blow the doors off seeing how it has the exact same engine as the 2013 even the specs are the same the only difference is it’s a tad bit lighter and has IRS. The 2005-2010 GT has the 300-315hp 4.6, the 2011-2013 came with the 400+hp 5.0, so five of the eight years of the S197 would get their doors blown off by this Mustang. Yea first gen s197’s will get their doors blown off cause the 4.6 lacked alot of power…. but he said basically in general all s197 will get destroyed by the S550. Don’t think so…..I don’t like the narrow headlights and I don’t like the redesigned front end. Can’t see the back end so ??? I would actually be fine with most things about this car…but what the hell happened to the quarter windows??? Looks to much like a sedan. Where is the muscle look? I like the new engineering aspects of the new pony. Looks? Not to sure yet. From the side, the rear quarter panel around the new sleeker rear window looks a bit like a Camaro. I like Fords.